A former office building in the centre of Edinburgh has been successfully converted into a 127 room hotel for Premier Inn with work now completed by contractors Interserve. New Premier Inn completed York Place Edinburgh is located in Edinburgh’s New Town and World Heritage Site, the 127 bed hotel sits next to St. Paul’s & St. George’s Church on York Place. The prestigious development in the heart of Edinburgh’s New Town sees the existing 40,000 sq ft offices formerly used by HM Revenue & Customs converted into a 127 bedroom Premier Inn hotel for Whitbread plc. New Premier Inn completed York Place Edinburgh. “Our design team worked in close partnership with Edinburgh Council, Premier Inn and Interserve Construc­tion to ensure delivery of a high quality building and brand in this planning sensitive area within the World Heritage Site of Edinburgh’s New Town.” Mark Emlick, CEO of Consensus Capital Group. The Holmes Miller-designed project is a conversion of a 1970’s exposed concrete office block, stripped back to structure, and given a new contextually sensitive lease of life. The renovated building is clad in stone and zinc with full height glazing. New Premier Inn completed York Place Edinburgh. 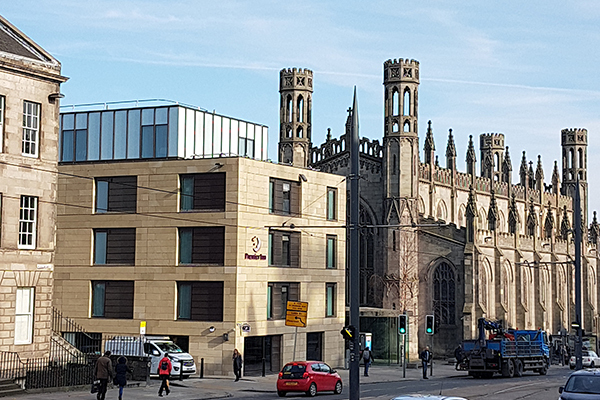 The new Premier Inn completed York Place Edinburgh:Premier Inn Edinburgh City Centre (York Place) is positioned a short walk from the shopping mecca of Princes Street, Edinburgh Playhouse and Edinburgh Waverley train station. There’s no end of things to get up to near this Edinburgh hotel. Walk the Royal Mile from the Palace of Holyroodhouse to Edinburgh Castle and you’ll discover The Real Mary King’s Close, Museum of Childhood and more. At the end of a long day, dine at Thyme then relax in style in one of our new-generation bedrooms each featuring an impressive 40″ flat screen TV, bright, modern bathroom with a large shower head, and slumber-inducing, king-size Hypnos bed. Fronting York Place and adjacent to one of the stops in Edinburgh’s new tram network, the hotel is less than a minute’s walk from Princess Street, St Andrew Square, the Edinburgh Play House, the Omni Leisure Cen­tre and the newly proposed St James Quarter shopping centre. Read more at Scottish Construction Now.